The plaster scratch coat is applied to the recess and the surrounding area where the plaster was removed. Next the flue needs to be finished. The flue pipe installed earlier is left dangling. This needs to be fixed in place, which is done with a registration plate. The photo shows the inside of the chimney (looking up – note the void with builder’s rubble has been removed) and shows the flue. Our installer has fixed the registration plate rails, which the registration plate will fix to. The flue liner is fitted with a flue connector and flange plate. The flange will fix to the registration plate. The registration plate is simply a piece of steel sheet (2mm), cut to size to fit the chimney aperture. A hole is cut in the centre (in this case) to ‘register’ the flue to the wood burner. Note that the flue connector and registration plate are bedded with with fire paste and the plate fitted to the rails with self tapping hex head screws. 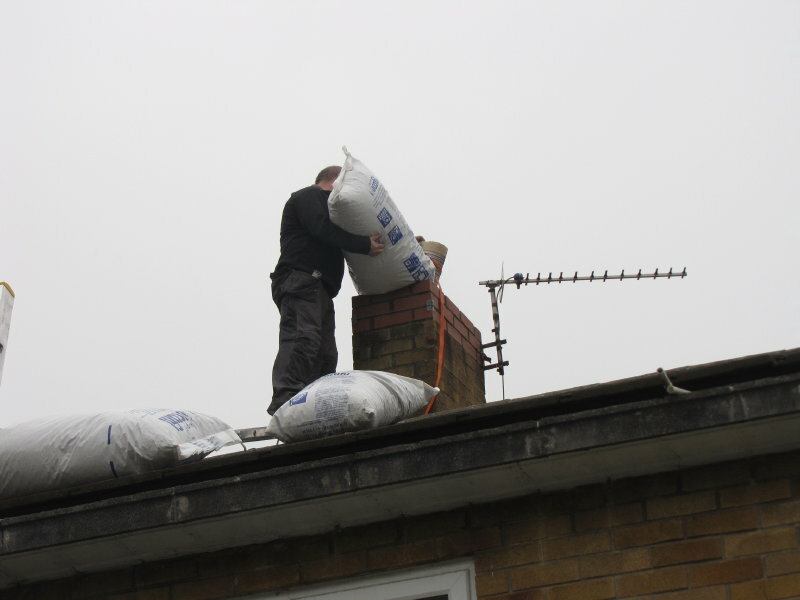 Once the registration plate installation was complete, the chimney needed to be insulated. The vermiculite insulant was poured in from the top of the chimney. Even though our chimney is in the middle of the house, it was still decided to insulate it. 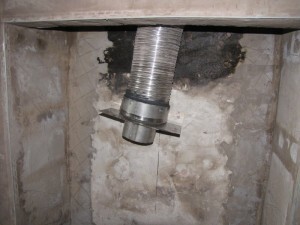 This is becasue the insulant will fill the void between the flue liner and the chimney wall offering a) greater stability during chimney sweeps, and b) the ability to conduct some heat from the flue to the surrounding elements, i.e.warming the chimney breast – secondary heat that would otherwise be lost through convection. 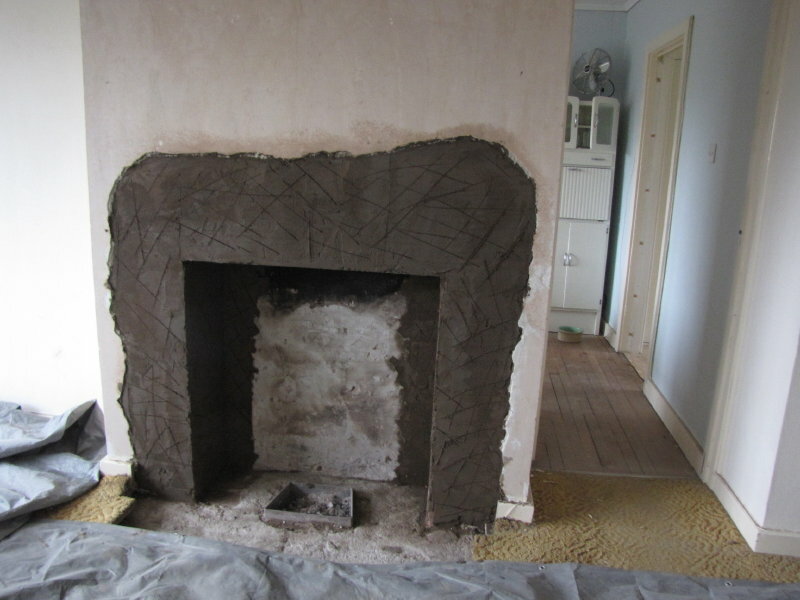 The existing structural hearth needs a fire hearth installed on top. The structural hearth is a cast in-situ slab of concrete set approximately 50mm below finished floor level. 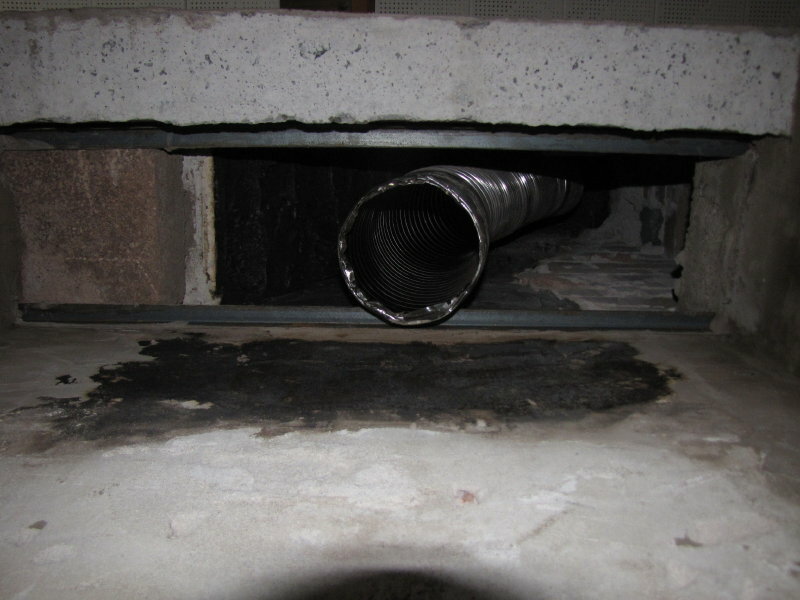 It contains an ash pit (see first picture in this post) for the original fire, which extends through the hearth to the floor void below. The plan is to use this existing pit as a way of providing make-up ar for the wood burner (more on this later). A flexible duct is set within the pit, connecting to the void below. 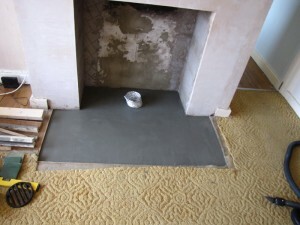 The fire hearth is then cast with concrete, poured on top of the structural hearth. This is then finished with a levelling screed, prior to tiling. This entry was posted in Heating and Hot water System, Renovation and tagged Chimney, Existing House, Wood Burner by admin. Bookmark the permalink.